You may recall the fast food strikes of last summer, during which workers protested for salaries that might resemble a living wage. In July, with the chant "No more burgers. No more fries. Make our wages super-sized," scores of workers staged protests against the minimum wage, urging companies to form unions and double salaries. 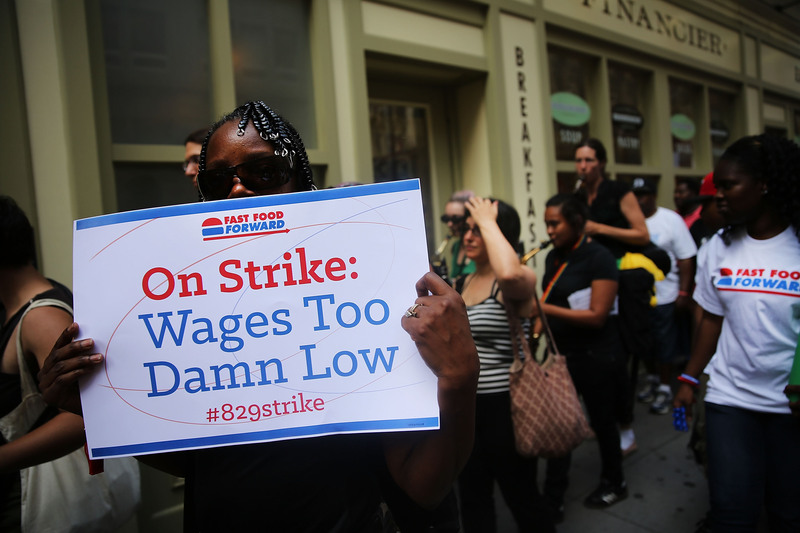 But it's already difficult to unionize fast-food workers, since the yearly turnover rate hovers around 75 percent. According to a report from the University of California, Berkeley, the government spends an estimated $7 billion in tax dollars to help "fast-food families" make ends meet. Statistics from that report, which was funded by labor organization Fast Food Forward, were used in a new video where a McDonald's employee calls the company's "McResource" help line — and gets a less-than-helpful response. In the video, which was created by the group Low Pay Is Not OK, a 10-year McDonald's employee Nancy calls the hotline to seek food and health care assistance. She is encouraged to participate in government programs such as food stamps, Medicaid, and food pantries. According to the video, Nancy has two kids and has never received a raise over her $8.25/hour wage. There was never any mention of how McDonald's could directly help her situation. The group maintains that "52 percent of fast-food families use public assistance benefits to survive." The Atlantic's Jordan Weissmann notes that he received an unedited version of the video from the group's spokesperson, but could not use it because it contained personal information. He deemed the edited video "fair." It's been proven that workers cannot sustain themselves and their families on minimum wage. In fact, when McDonald's teamed up with Visa to try to illustrate how workers can live on its salaries, the plan clearly backfired: A sample paycheck was based on more than 70 hours of work per week left out expenses like heating, and assumed workers had a second job or spouse to pick up the bills. Even though California voted to increase its minimum wage to $10/hour by 2016, and New York is debating whether its increase will create jobs or close businesses, it's clear the minimum wage debate is far from over.